In baseball, a number of coaches assist in the smooth functioning of a team. They are assistants to the manager, who determines the lineup and decides how to substitute players during the game. Beyond the manager, more than a half dozen coaches may assist the manager in running the team. Baseball is unique in that the manager and coaches typically all wear numbered uniforms similar to those of the players. Notable exceptions to this were Baseball Hall of Fame manager Connie Mack, who always wore a black suit during his 50 years at the helm of the Philadelphia Athletics, and Burt Shotton, manager of the Brooklyn Dodgers in the late 1940s, who wore a Dodger 200 cap and a team jacket over street clothes in the dugout. After the widespread adoption of numbered uniforms in the early 1930s, Joe McCarthy, another Hall of Fame manager, wore a full uniform but no number on his back for the remainder of his career (with the New York Yankees, then the Boston Red Sox). Coincidentally, all three men retired during or after the same season — 1950. 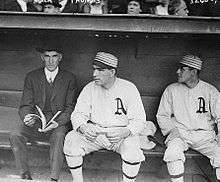 Full-time coaches in professional baseball date to 1909, when John McGraw of the New York Giants engaged Arlie Latham and Wilbert Robinson as coaches. By the 1920s, most Major League teams had two full-time coaches, although the manager often doubled as third-base coach and specialists such as pitching coaches were rare. After World War II, most MLB teams listed between three and five coaches on their roster, as managers increasingly ran their teams from the dugout full-time, and appointed pitching and bullpen coaches to assist them and the baseline coaches. Batting and bench coaches came into vogue during the 1960s and later. Because of the proliferation of uniformed coaches in the modern game, Major League Baseball now restricts the number of uniformed staff to six coaches and one manager during the course of a game. There are 268 coaches in MLB. The first bench coach in baseball was George Huff, who took that helm for the Illinois Fighting Illini baseball in 1905; at the time, it meant a coach present throughout the season. More recently, the bench coach is a team's second-in-command. The bench coach serves as an in-game advisor to the manager, offering situational advice, and bouncing ideas back and forth in order to assist the manager in making game decisions. If the manager is ejected, suspended, or unable to attend a game for any reason, the bench coach assumes the position of acting manager. If the manager is fired or resigns during the season, it is usually the bench coach who gets promoted to interim manager. The bench coach's responsibilities also include helping to set up the day's practice and stretching routines before a game, as well as coordinating spring training routines and practices. A pitching coach mentors and trains teams' pitchers. He advises the manager on the condition of pitchers and their arms, and serves as an in-game coach for the pitcher currently on the mound. When a manager makes a visit to the mound, he typically is doing so to make a pitching change or to discuss situational defense. However, to talk about mechanics or how to pitch to a particular batter, the pitching coach is the one who will typically visit the mound. As the name suggests, the pitching coach is generally a former pitcher. One exception is Dave Duncan, the former pitching coach of the St. Louis Cardinals, who was a catcher. Prior to the early 1950s, pitching coaches were usually former catchers. The bullpen coach is similar to a pitching coach, but works primarily with relief pitchers in the bullpen. He does not make mound visits, however, as he stays in the bullpen the entire game, working with relievers who are warming up to enter the game. Generally, the bullpen coach is either a former pitcher or catcher. A hitting coach, as the name suggests, works with a team's players to improve their hitting techniques and form. He monitors players' swings during the game and over the course of the season, advising them when necessary between at-bats on adjustments to make. He also oversees their performance during practices, cage sessions, and pre-game batting practice. With the advent of technology, hitting coaches are increasingly utilizing video to analyze their hitters along with scouting the opposing pitchers. Video has allowed hitting coaches to clearly illustrate problem areas in the swing, making the adjustment period quicker for the player being analyzed. This process is typically called video analysis. Two on-field coaches are present when the team is at bat. Stationed in designated coaches' boxes near first and third base, they are appropriately named base coaches—individually, first base coach and third base coach. They assist in the direction of baserunners, help prevent pickoffs, and relay signals sent from the manager in the dugout to runners and batters. While the first base coach is primarily responsible for the batter as to whether he stops at first base or not or for a runner already on first, the third base coach carries more responsibility. His duties include holding or sending runners rounding second and third bases, as well as having to make critical, split-second decisions about whether to try to score a runner on a hit, and accounting for the arm strength of the opposing team's fielder and the speed and position of his baserunner. The bench coach, third base coach, and first base coach often are assigned additional responsibility for assisting players in specific areas, particularly defense. Common designations include outfield instructor, infield instructor, catching instructor and baserunning instructor. When a coaching staff is assembled, the selection of the first base coach is frequently made with the purpose of filling a gap in these coaching responsibilities, as the actual in-game duties of a first base coach are relatively light. Teams may also employ individuals to work with players in other areas or activities. These positions sometimes include the word "coach" in their titles. Individuals holding these positions usually do not dress in uniform during games, as the number of uniformed coaches is restricted by Major League Baseball rules. The most prominent of these positions are the athletic trainer and the strength and conditioning coach. All Major League Baseball teams employ an athletic trainer; most employ a strength and conditioning coach. Other positions include bullpen catcher and batting practice pitcher. Some teams also employ additional coaches without specific responsibilities. In general, Major League Baseball teams will have one person specifically assigned to each coaching position described above. However, minor league and amateur teams typically have coaches fulfill multiple responsibilities. A typical minor league/amateur team coaching structure will have a manager, a pitching coach, and a hitting coach, each of whom also assumes the responsibilities of the first and third base coaches, bullpen coach, etc. In U.S. college baseball, the title "manager" is not used; the person who fills the role of a professional manager is instead called the "head coach". 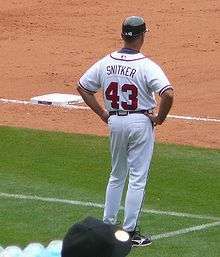 Wikimedia Commons has media related to Baseball coaches. ↑ Gagnon, Cappy (2004). Notre Dame Baseball Greats: From Anson to Yaz. Arcadia Publishing. p. 47. ISBN 0738532622. Retrieved 2014-10-29. Before the 1905 season, when George Huff took the helm for the University of Illinois, no college had ever employed a bench coach. Before that time (and for another 5-10 years at most colleges), anyone listed as 'coach' was either a professional player hired as the pre-season teacher of baseball, or was the player-coach or captain of the team. ↑ "The Role of the Bench Coach" – The Birdhouse Archived October 3, 2008, at the Wayback Machine. ↑ Zimniuch, Fran (2010). Fireman: The Evolution of the Closer in Baseball. Chicago: Triumph Books. p. 73. ISBN 978-1-60078-312-8.